William Morrow Paperbacks, 9780061782169, 384pp. 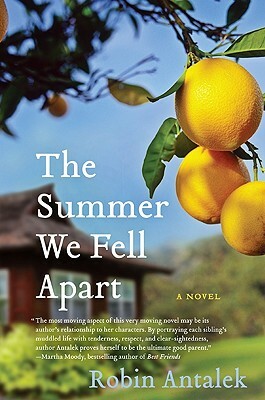 Robin Antalek is the author of The Summer We Fell Apart. She lives in Saratoga Springs, New York. In the opening chapter of The Summer We Fell Apart, Amy, the youngest Haas sibling, tells how Miriam, an exchange student from Switzerland, arrives on their doorstep with little more than a terse, flip announcement from their father before he departs for Europe. Miriam is not the only surprise that summer, as Amy discovers when her brother Finn returns to the family home seemingly adrift. With George about to depart for college, Amy is scrambling to make sense of what has happened to her family. What do you think of Amy's reaction to the situation? How do her brothers handle it differently from her? Why do you think Miriam stays when she is obviously unwanted? Amy and her brother George have an extremely close relationship. When the novel opens, Amy is still a somewhat naive teenager, despite all she has endured, and yet by the novel's end, she is in a stable and loving relationship having maintained a child-like sense of wonder about the world despite everything. How do you think the relationship between Amy and George helped or hurt them get to this point in their lives? In the Haas family, secrets and unanswered questions appear to be the foundation of their lives. They are manipulated by their bitter, alcoholic father and neglected by their mother, who seems bewildered by the state of her life and in reaction to that, hides from her children and their demands. Yet in the end, when Marilyn has a chance to tell her side of the story, she is still clearly unapologetic. She understands that to ask for forgiveness from her children is a null point. At the same time, she longs to be more present in their lives. Was Marilyn's benign neglect of her children justifiable in some sense? Do her children truly forgive her? Was it a fitting end that Marilyn had the last say? Richard Haas, the patriarch, is the only member of the Haas family that we don't hear from. Instead, we must rely on the memories of his children and his wife to tell his story. How do you think that adds or detracts from the book? Did you want Richard to have a voice? If yes, why? As the novel progresses, each character's stories eventually overlap, giving the reader a Rashoman storytelling effect where we get perspective and reaction on the same situation from many points of view. How did this help to fully realize the Haas siblings? Were there any surprises? Abandonment and neglect are strong themes in the book. For some, the fact that a mother does not exhibit the classic "mothering" instincts will be difficult. How did this affect your feelings for Marilyn? And for her children? The fact that George is gay is never really a topic for discussion. His acceptance among his siblings is secure enough that they can joke about his sexual preference without it being considered an affront. In a sense, George, of all his siblings, has the most conventional relationship, ending in marriage and parenthood. At one point in the book, Finn says to his mother that of all of them to get married, who would have expected George to be first. Did you? Do you think George's decision to take a more traditional path had to do with his lack of security as a child? Or his desire for a "normal" life? Do you think it has anything to do with his sexual preference? As the eldest, Kate shouldered the burden of raising her siblings. When she sees Eli after her father's funeral and then later, when they arrange to meet in a motel, we realize how manipulated Kate was by her father. How did you feel about Kate's infidelity with Eli? She bought the house in California thinking of a man who had a wife and two small children. Did you ever think Kate had realistic expectations of Eli leaving his family for her? Why do think she never comes out and asks him? What are your feelings about this after the pivotal scene where Kate destroys the rotting lemon tree? When Finn steals Shelley's truck, sketchbooks and painting and takes off after he finds out that Miriam has married and left his life for good, he seems powerless to stop his descent into addiction. When Kate puts his battered body on the airplane, he is defeated. Finn truly wants to die. What do you think saves him and gives him back his will to live? In the epilogue, the siblings are together for the first time since their father's funeral—this time, for George and Sam's wedding. There is a sense of hope that after everything they have been through, they are still a family. How would you describe their relationship to each other and their mother after all this time? Is it more forgiveness or acceptance? How do you think you would feel in the same situation? At its heart, this is a family novel. Do you think it adequately portrays the chaos and emotions between siblings in a large family? Why or why not?